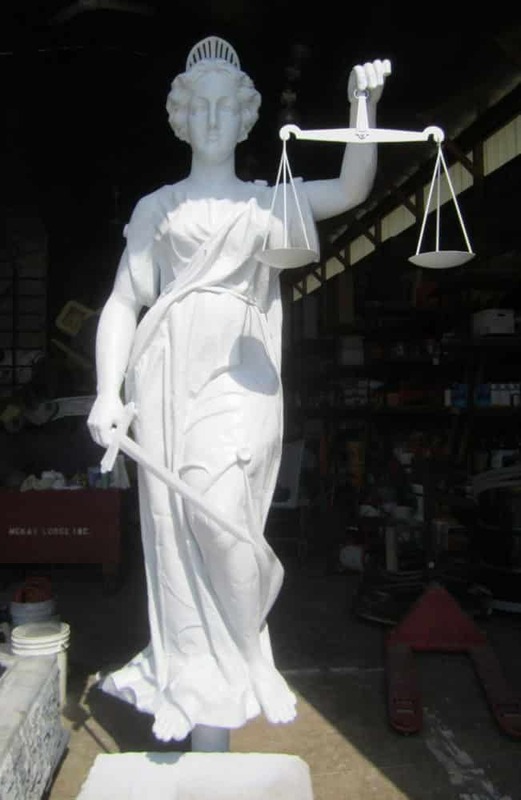 In a recent blog post we described our conservation projects in the Caribbean which included Lady Justice by Jan R. Mitchell, but it was this time of year -nearly seven years ago- that McKay Lodge Conservation Laboratory, Inc. was awarded the bid for the restoration of another Lady Justice of the El Paso County Courthouse in Texas. An extensive documentary, detailing the treatment in almost real time can be viewed here, but for the short version, please read below. The Lady Justice from Texas is much different in form, size, and material from the sculpture in St. Croix. Rather than bronze, this sculpture is zinc, and it was originally painted completely white, invoking the appearance of a Greek Marble statue. Instead of everyday clothes, the female figure is clad in long flowing robes and wears a small crown atop her head; this Lady Justice is also somewhat unique in that she was not crafted with a blindfold. The sculpture held a sword and balance (scales of justice) too, but these components were lost. At the time of the 2011 assessment, the sculpture was in poor condition due to time, the elements, and vandalism. The sculpture had remnants of an old coating, corrosion, several disfiguring repairs and missing components including an arm, and as previously mentioned, sword and iconic scales. In addition, the zinc sculpture required a new armature for support and reinstallation. Typically, stainless steel is used as armature due to its ability to resist corrosion. The stabilization and restoration project for the Lady Justice of the El Paso County Courthouse in Texas was put out to bid, and eventually awarded to McKay Lodge Conservation Laboratory, Inc. The company is fortunate to have a number of contracts and awards throughout the years, serving both the United States General Services Administration, National Park Service, state and local governments, and cultural institutions. The Lady Justice zinc sculpture once stood atop the former 19th century El Paso County Courthouse, but the building was demolished in the early 20th century. 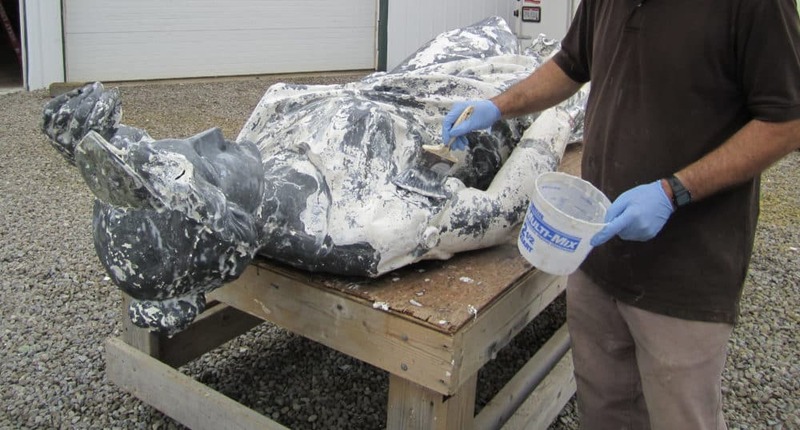 It was then installed in several other locations before finally coming to our art conservation facilities on the outskirts of Cleveland, Ohio for treatment. You can read more about the sculpture’s history here or in the online brochure detailing the history, funding, and restoration of the Lady Justice sculpture by the El Paso County Community Foundation. Upon arrival at our lab, the sculpture was removed from its crate. 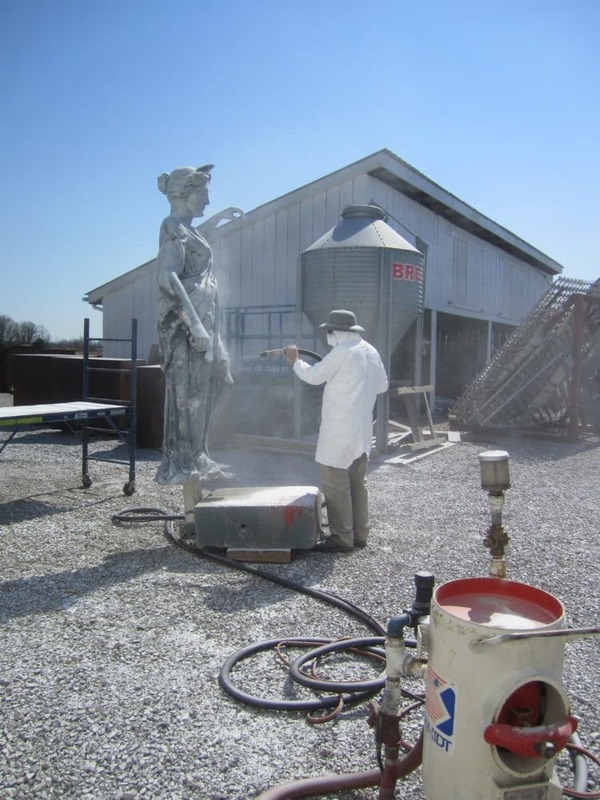 The zinc sculpture conservation treatment began with removing the previous, failed coating with a chemical stripper; the surface was then neutralized. Any coating remnants were further removed with a gentle pressure washing. It was an important step so that the surface is clean and free of contaminants for the metal repairs, and an eventual recoating. Disfiguring or failing repairs such as the proper left arm or crushed areas like the proper left foot needed to be removed and reformed or replaced. 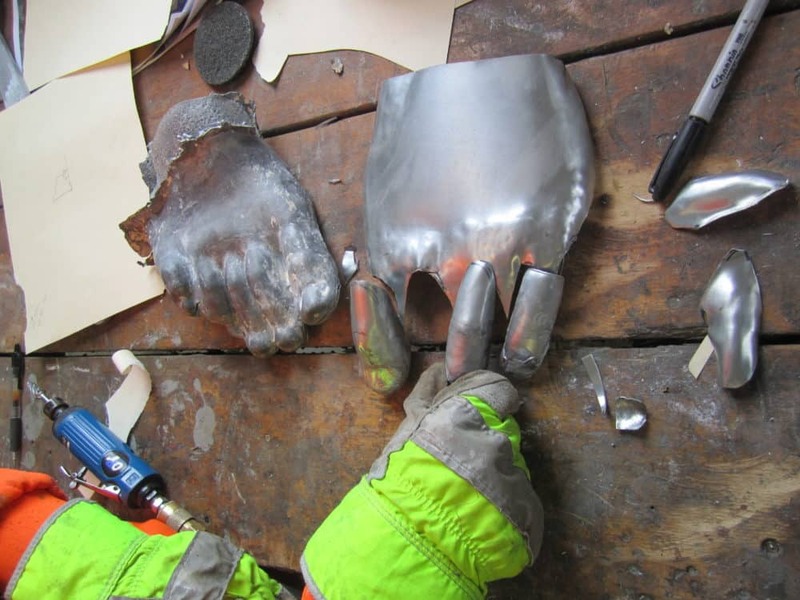 This is a meticulous and delicate process that requires experience in working with soft metals such as zinc or lead like Senior Conservator of Sculpture, Thomas Podnar. As the repairs were removed, the edges were ground clean so that new metal can bond to the surface. Original but bent components which could be saved were then shaped by Conservator of Public Art and Sculpture, Jim Gwinner. For missing or too badly damaged components, lead project conservator Podnar carefully measured each element. 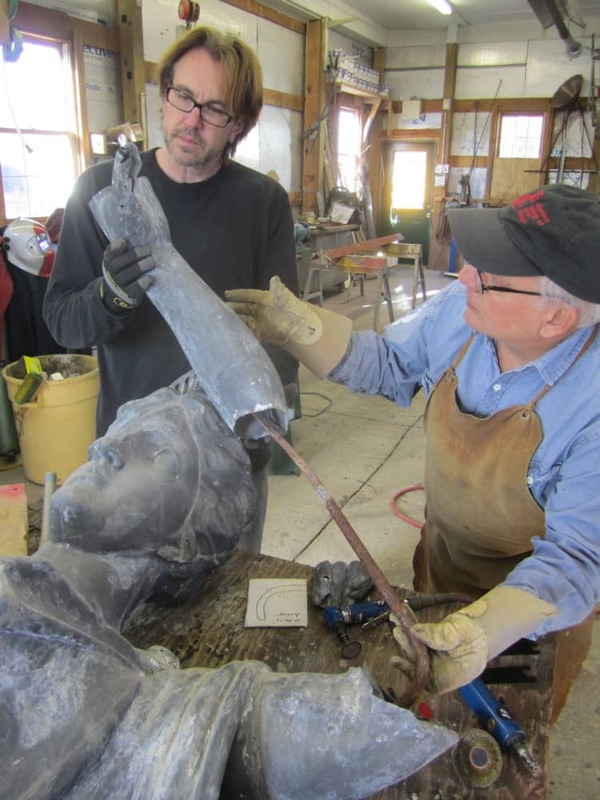 Both Podnar and Gwinner are trained sculptors in addition to their conservation experience, so they are able to readily replicate missing components with preservation principles in mind. New components were shaped first out of a compatible zinc sheet, then their shape, size, and orientation were compared to an original sculpture in storage by conservator Podnar before attaching them to the figure during treatment. Once the size and shape were verified, they were attached to the sculpture with hot metal joins. 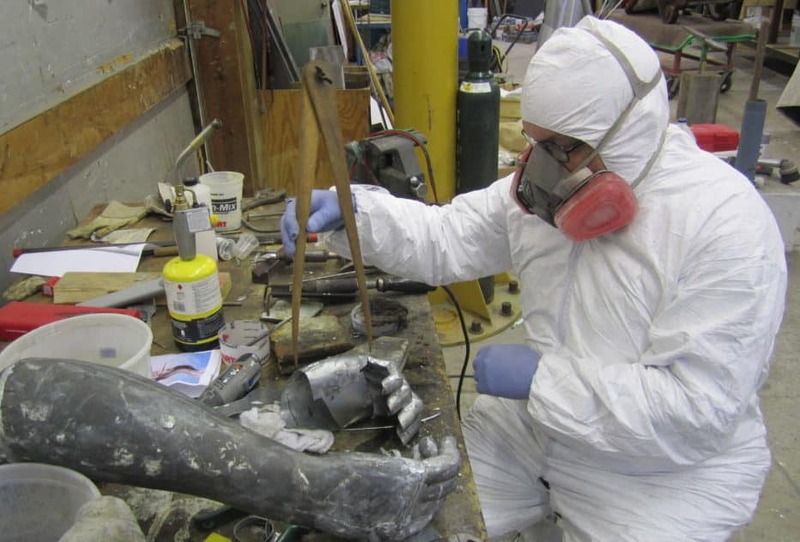 For zinc statues and other metal sculpture, the McKay Lodge Conservation team avoids epoxies and other adhesives as much as possible since the bonds they create are not strong enough for these types of artifacts. A new support and base were also secured to the sculpture after the interior had been cleaned for easy reinstallation. In order to disguise the metal repairs and prepare the surface for painting, the surface was cleaned with abrasive blasting. This is another critical step to remove any contaminants and to even out the appearance of the surface. Like the original, this would be painted to imitate a marble statue. The cleaned surface was primed and finished with white top coat matching the original color as much as possible, but providing the durability and color retention possible with a modern coating. 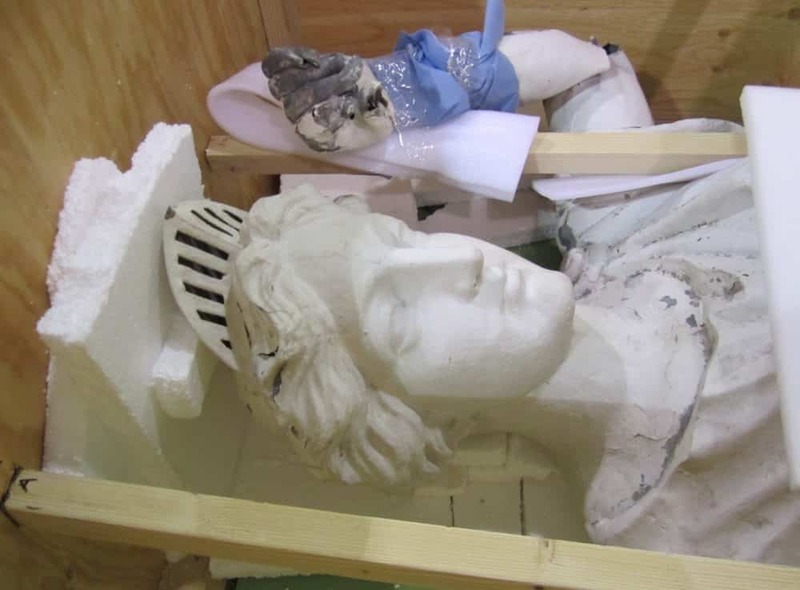 The sculpture was returned to El Paso for reinstallation indoors. In addition to the extensive image and video documentation by McKay Lodge Conservation provided to the client, the Lady Justice zinc sculpture was welcomed back with an official ribbon-cutting ceremony at the El Paso County Courthouse, also captured on video.